Lees Adventure Sports catalog will outfit you for every outdoor adventure you want to tackle, with sports equipment, gear and apparel for camping, climbing, snowboarding, in-line skating and more. 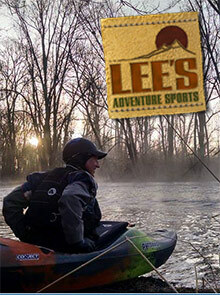 Your savings will be applied automatically at checkout on the Lee's Adventure Sports website. Outdoor Gear - If you are planning an outdoor adventure, this is the place to find the sturdiest, high quality equipment to ensure your peak performance and comfort. Choose down sleeping bags for outdoor camping, camp food and stoves for tasty outdoor cooking and hiking poles and hiking boots to keep you moving on the trail. For climbing, hiking, backpacking, and sleeping under the stars, this is the outdoor sports gear store that has the right equipment for your campsite. Winter Sports Equipment - Lee's Adventure Sports catalog is your one stop winter sports shop, with everything you need to enjoy the snow. They have ski gear, snowboard equipment, snowshoes, and accessories for every winter sports enthusiast, from the bunny slope beginner to the avid cross country skier. You will find the cold weather gear you need for every adventure, with ski boots from Volkl, Nordica, Salomon and many other major brands you love, as well as helmets, googles and waxing and tuning equipment for your skis and snowboards. Adventure Apparel - Every outdoor sport has specific clothing requirements. Whether your preference is hiking, climbing, paddling or running, you know that the state of the art fabrics and well designed activewear can make the difference in your performance. Shop the best selection of men's and women's apparel for moisture wicking base layers, sweaters, hoodies, bottoms, shirts and body heat conserving outerwear. You will find the technical apparel you need for your specific sport, from board shorts and swimwear for stand up paddle boarding to ski pants and jackets. They have a complete range of kids sportswear too. Top Adventure Gear Brands - With the Lees Adventure Sports coupon code, and outdoor specialists who know that when you find the right equipment and apparel from a brand that matches your style, you will be happy shopping for the gear you need. They make it easy to shop by brand in their online sports store so that you can find the newest products from great companies like Osprey Packs, Northface, Marmot, GoPro, Wilderness Systems, MSR and many more. Lee's Adventure Sports started as family owned outdoor sports gear store in 1954, and has grown into an adventure sports destination committed to performance quality, customer service and awesome brands. If you need advice on your sporting equipment and accessories, their expert sports product staff are available to help by phone, guiding you through their extensive selection of gear for every adventure sport you can name.